Based on 15 years of experience in the field of SFC automation, our current system combines proven technologies with new ideas inspired by our customers offering a maximum of flexibility, efficiency and comfort. The SFC automation runs on our VariSam platform, sized to your needs, equipped with personal protection, electronic gripper, sensors and our SFC dry baths. Your SFC automation comes with the Windows-based software SFC-Application 2.1, that has an up-to-date and user-friendly interface allowing you to run many different methods, even with a small number of temperature baths. The new features like sample input slider, automatic door lock, safety doors or light curtains makes you feel safe when working with our Automation, even with the very fast systems. The convenient solution to work always with exact temperatures. This is ensured by our newest development, which performs automatic temperature calibrations in custom defined periods. For documentation (e.g. for audits) the software produces a report for each calibration. Save a complete work step by putting the samples directly into the heated input block, which replaces a complete melting bath. You still want to use a water bath in addition to our dry baths? No problem, we integrate it into our automation. The sample tubes are dried automatically with air pressure and brushes for the next step after using the water baths. 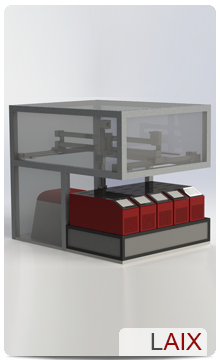 Like most of our products, SFC automation is designed as a modular system. This allows us to take your methods and a sample throughput as a basis for creating a system that exactly meets your needs. We are a young enterprise striving for progress and constantly looking for new employees for our team in the areas of production, sales, development and administration. We are looking forward to reviewing your application, please use our contact form. Laix Technologies is always searching for new business partners and resellers worldwide. If you are interested in cooperation or in our innovative and interesting products, please contact us.